Entry filed under: Book Talk, Chapbooks and Small Presses, Featured Products, Inventory News, Q & A. Tags: bookmaker, books, chapbooks, literature, poetry, shop local, Shop Small, spotlights. Thanks to Book Culture for this wonderful opportunity! Just wanted to give full credit to the wonderful participants in our Exhibit A: Re/Production and Re/Presentation Panel, pictured at top without a caption: L-R: Fr. 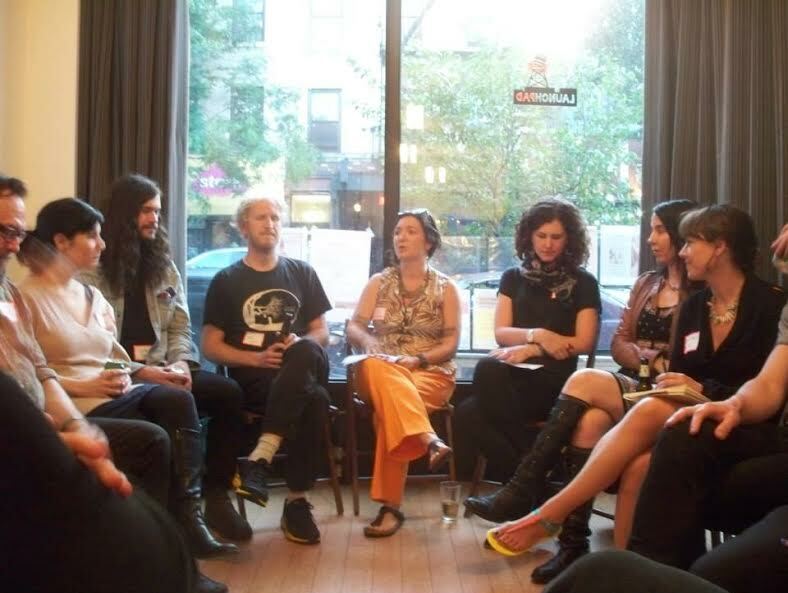 Frank Sabatte, Michael Berube, and Keena Gonzales (all Openings Collective, NYC), Jacob Perkins and Matt Nelson (Mellow Pages Library), me, Georgia Elrod (Painter, Heliopolis Project Space), Shana Maurizi (Filmmaker, WORK ONLY), Montana Ray (BLT Salon, Poets House Fellow), and the feet of Kevin William Reed (Drive By Press), and Seldon Yuan (SSCY, Center for Book Arts); at LaunchPad, Brooklyn, June 2013. The magazines at center are PRINT Vol. 2 (Exit Strata) and PRINT Vol. 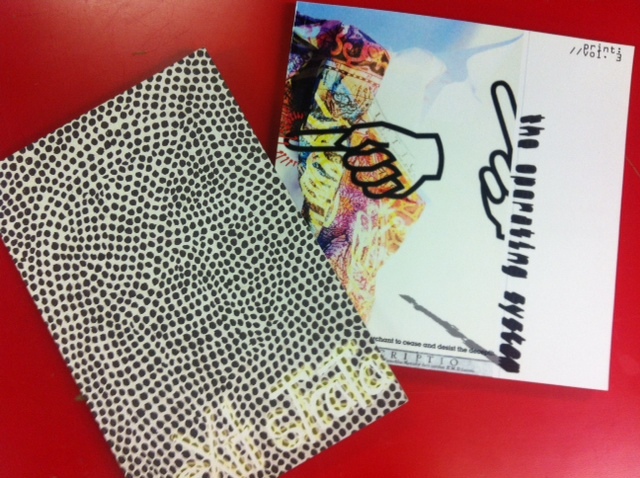 3 (The Operating System); with cover art by Carey Maxon (L) and Eric Meyer/Aaron Liechty (R). 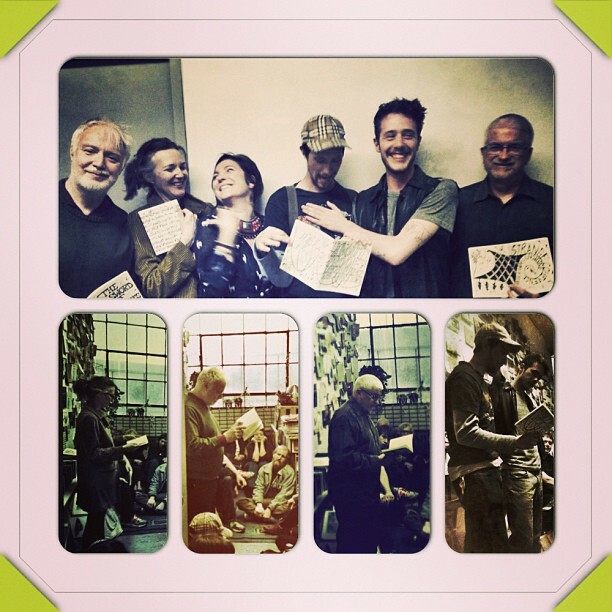 The collaged picture midway through includes PRINT:DOCUMENT Series I Chapbook Poets (L-R at bottom: Alexis Quinlan, Tony Hoffman, Bill Considine, Lancelot Runge and John Kropa; w/ myself at top); at their reading at Mellow Pages Library in Brooklyn, April 2013. Gratitude and great respect, for an independent bookstore we love, and to all the creators – and work – pictured here.